1. The terrorist threat. Is the U.S. safer from terrorism now than five, 10 years ago? The administration has said the core of Al Qaeda has been largely decimated but breakout cells and affiliates have cropped up. How far is the terrorists' reach? What type of attacks does the U.S. still potentially face? Is the intelligence community effectively connecting the dots? Where are we most vulnerable? We get answers from the chairs of the Senate and House Intelligence Committees, Sen. Dianne Feinstein and Rep. Mike Rogers this Sunday on State of the Union. 2. GOP to Dems: You'll be sorry. A day after Senate Democrats exercised the so-called nuclear option to change the filibuster rules, the long-term political fallout is still in question. But Republicans say Democrats will eventually pay a price, perhaps as early as next year's mid-term elections. "The solution to this problem is an election. The solution to this problem is at the ballot box," Senate Republican leader Mitch McConnell said. "We look forward to having a great election on 2014." A mistake by Senate Dems? Be sure to watch our all-star political panel Sunday on State of the Union. 3. Deal or no deal, Part 2. 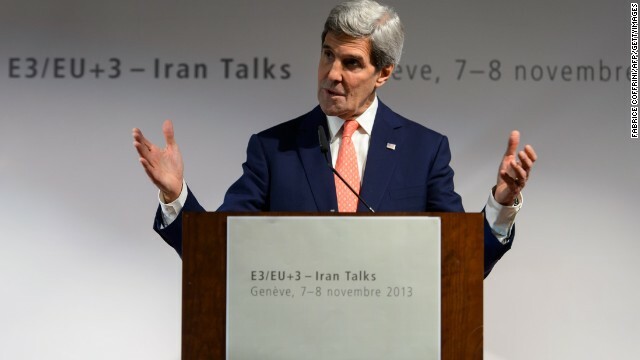 Secretary of State John Kerry is headed back to Geneva to rejoin talks on a potential nuclear deal with Iran. Kerry is going back to the negotiating table "with the goal of continuing to help narrow the differences and move closer to an agreement," said State Department spokeswoman Jen Psaki. Kerry took part in negotiations earlier this month, but the U.S., its European allies and Iran fell short of an agreement. The potential deal's framework would require Iran not to pursue a nuclear weapon in exchange for an easing of crippling economic sanctions. 4. Walker's immigration fix. Immigration reform may be at a standstill in Washington but Wisconsin Republican Gov. Scott Walker is offering his solution: make it easier for qualified immigrants to come to the United States legally and focus less on the nation's 11 million undocumented immigrants. "From an immigration standpoint it's simple," Walker said. "If you want to come into America today legally, it is very, very difficult from my point of view, to do so on a timely basis... We should be finding a way for that to be easier to do in the United States." Walker has been mentioned as a potential 2016 White House contender Could he be trying to thread the needle on an issue that has cost Republicans? 5. Cell phones in flight? Not so fast. The Federal Communications Commission is considering rules that would allow air travelers to talk on their cell phones during flight. The proposal has the support of the head of the FCC, but many consumers are making it clear they don't like the plan and the nation's flight attendants have their back. "Passengers overwhelming reject cell phone use in the aircraft cabin. The FCC should not proceed with this proposal," the Association of Flight Attendants-CWA said in a statement. "Passengers making phone calls could extend beyond a mere nuisance, creating negative effects on aviation safety and security that are great and far too risky." Makes you think twice about sitting next someone talking on the cell phone during a three-hour flight.